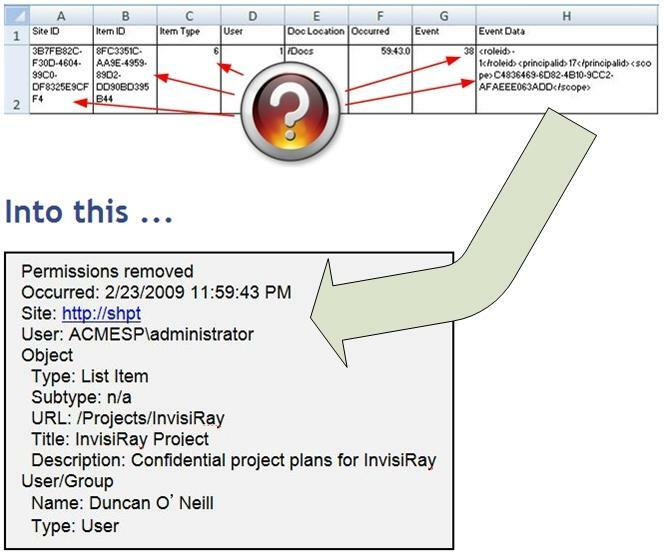 SharePoint's audit log does not provide the names of users or objects. SharePoint's audit log is buried in SharePoint's SQL server content database. To ensure the integrity of audit trails, logs must be moved from the system where they are generated to separate and security log archive. However in SharePoint, the audit log isn't really a log - it's a table in the SharePoint database. This makes it inaccessible for most log management solutions. Without the ability to collect the SharePoint audit log into a separate, secure log archive its value as a high integrity audit trail is compromised. SharePoint's audit log has no reporting. In Windows Sharepoint Services the log is totally inaccessible and in Office Sharepoint Services it's exposed through through a few rudimentary, impractical reports in Excel. Windows SharePoint Services provides no interface for enabling auditing at all. The audit log is there but without custom programming there's no way to turn it on; much less access the logs. I'm still a software developer at heart and the problems with the SharePoint audit log finally pushed me over the edge. The result is LOGbinder SP. LOGbinder SP is a small, efficient Windows service that monitors the internal SharePoint audit log without making any changes to your SharePoint installation. For each event LOGbinder SP resolves the user and object IDs and other cryptic codes, producing an easy to understand, plain-English translation of the SharePoint audit event. LOGbinder SP then sends these events to the Windows event log (either the Security log or a custom log) which in turn allows you to leverage any log management solution to collect, monitor, alert, analyze, report and archive SharePoint audit logs. Here's an example event from the SharePoint audit log pictured as delivered via Excel compared to what the event looks like after LOGbinder SP translates it. Please try it out and tell me what you think!